We are most grateful for all the support we have received from friends and customers all around the World following the Earthquakes that have caused so much devastation in Christchurch. Sadly, our two lovely old buildings were demolished in July (2011). We were very lucky to be able to recover most of our customers' cars that we had for sale on consignment and were able to save a lot of the memorabilia that we had on display. All our stock was destroyed by water that had come through the collapsed roof, but the memorabilia which was in display cases had an extra level of protection and mostly survived. As from 1st March 2012, we are back in business buying and selling classic cars. See our stock list of classics for sale on this web site. With over 23 years experience, we have contacts thru out N.Z. and around the world. Because of our contacts many cars are sold without even being advertised. Please phone or email if you are looking for a particular classic or have a car you want us to sell. We are now taking orders for the fabulous new range of Morgans available in 2012, including the 3 wheeler. Our demonstrater is here for you to test drive today. Motoring books and models will still be a while away. 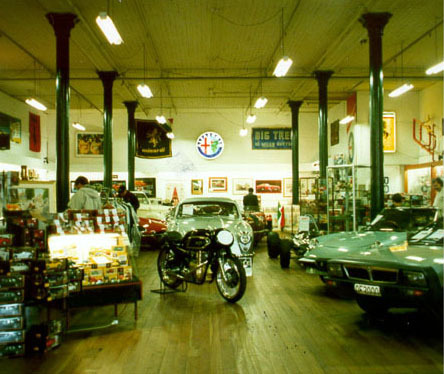 FAZAZZ The Motorist's Shop opened in Christchurch, New Zealand, in 1989. 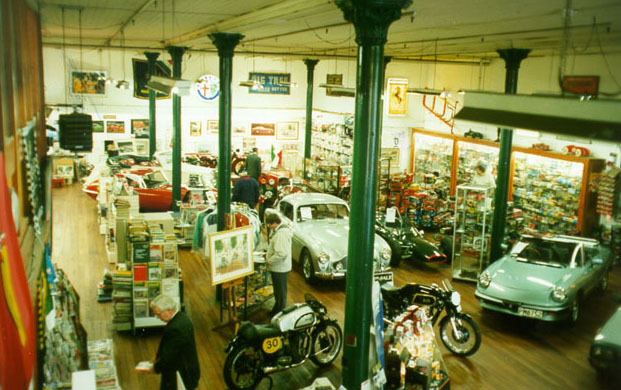 Originally conceived as a retail shop for motoring memorabilia and collectables, the shop has developed into a showcase for automobiles, motorcycles and accessories. 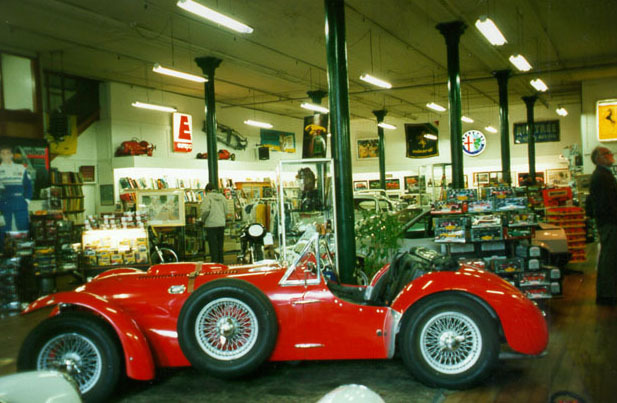 Fazazz specialises in the history of New Zealand motoring. The New Zealand dollar exchange rate makes the purchase of interesting vehicles and memorabilia from New Zealand very attractive. Check your exchange rate now! We have been trying for several years to source classic-style, string back Driving Gloves. We have been able to import a quantity of the most beautiful British-made gloves with simply the softest leather you could find and true classic styling. A limited quality available now� Please enquire. Original works and signed limited edition prints by Alan Fearnley, Juan Carlos Ferrigno, Jay Koka, Dennis Taylor, Michael Turner and others. Click here to see a range of prints available now. We always have approximately 20 interesting cars on display and for sale, in addition to a number of motorcycles. Click here to see a selection from our showroom. We always have a selection of interesting automotive items. Brass lamps, Tools, Instruments, A.A Badges, Fuel company items. We stock a large range of lapel & cap badges for many marques. Also key rings and embroidered patches, racing goggles, leather helmets, hand-woven scarves, driving gloves, tee shirts and jackets. 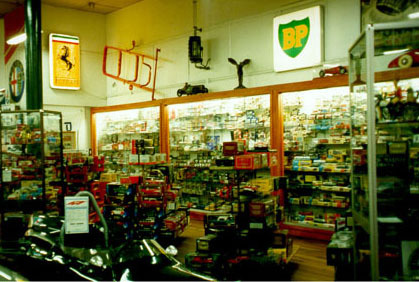 NEW - We Carry the largest selection of automotive and motorcycle titles in New Zealand and our prices are excellent! New Shipments arriving regularly. Over 3000 titles in stock. MEMORIES OF THE BEAR. Limited Edition. A limited edition of 20 only numbered copies, bound in green leather with the title blocked to the spine, marbled end papers and green cloth covered slip case. Signed by the Author, Eoin Young and by Michael Clark who wrote the last two chapters. Signed also by Denny�s widow Greeta Hulme, by Wally Willmott-McLaren Racing�s first mechanic and by Peter Bruin and Garry Taylor � also McLaren mechanics. A Limited Edition for the Klemantaski Collection, this is number 43 of only 65. This fabulous book contains a selection of photographs covering Gonzalez career, many not seen before. Ride. The Story of cycling in New Zealand. Fascinating. A particularly interesting historical tome. Softbound $39.95. Hardbound limited edition, signed by the authors and numbered $69.95. Full of amazing photographs. Christchurch�s John Britten, creator of the fabulous Britten V1000 Motorcycle, has inspired two books on his life and work. Both are fascinating books and a must for any motorcycle enthusiast�s bookshelf. VICTORIA WATER. A Celebration of the Christchurch Model Yacht Club established 1898 by Euan Sarginson and Hugh Hobden. We stock a huge range of current monthly magazines and provide a standing order service for a large number of customers. Click here to view a selection of secondhand books from our showroom.. Please note � the books shown in the above link are only a small selection of our current stock. If you are looking for something in particular, please email Fazazz with your request. New and secondhand - Matchbox, Dinky, Corgi, Brumm, Revell, Bburago, Detail, Vanguard, Solido, Verem, Box, Bang, Maisto, Ansom, Lledo, R.A.E, Elicor, Progetto K, Micro, Rio, Quartzo, Traz, Paradise Garage, etc. etc. We always have 200 or more titles covering all areas of motorsport.